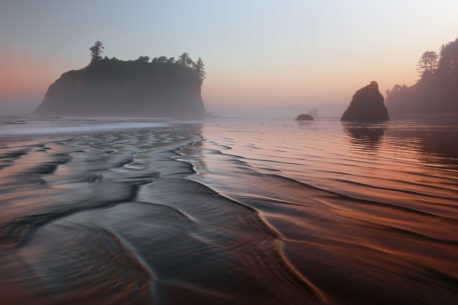 From the town of Forks, Washington follow Highway 101 southward until you see signs for parking spots for Ruby Beach on your right. The trail going down to Ruby Beach starts at the parking lot. Olympic National Park can get really busy in the summer and sunset seems to to be a more popular time. So choosing an early morning shoot at Ruby Beach turned-out to be a rewarding decision when I found this beautiful place all to myself. Maybe they knew there wasn't going to be any wild, colorful skies this particular morning but I didn't mind it at all. In fact the sea stacks and the overhanging marine layer were suggesting a more moody and surreal image. With the mid-ground subjects and the diffused light already in place, I just waited for the the waves and ripples to produce an interesting foreground and snapped away.